Lost amidst the ongoing jubilation over Barack Obama’s victory is the intensifying internal war that threatens to undermine SEIU, the nation’s strongest and most politically powerful union. The dispute between SEIU International and its 150,000 member UHW local has been raging since March, and even threatened to divert union energies from the November elections. But final hearings on the international’s claims that UHW had committed financial improprieties were delayed until last week, and appear to have concluded without sufficient evidence to support putting the local into trusteeship. Ideally, this would have been the end of the matter. With Barack Obama and progressive forces needing a strong SEIU to win universal health care, immigration reform and other battles come January, this is the worst of all times to have these forces divided over internal fights. But as readers of my new book, Beyond the Fields: Cesar Chavez, the UFW, and the Struggle for Justice in the 21st Century, will learn, unions do not pick the best times to self-destruct. The UFW imploded after winning its greatest victory in the fields, and SEIU—home to many UFW alums—faces a full-fledged internal war just as Barack Obama creates historic openings for progressives. 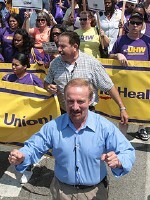 Following hearings that left the case for trusteeship based on corruption inconclusive, SEIU International announced what UHW describes as its “Plan B.” International President Andy Stern notified UHW last Monday that SEIU had begun mailing ballots to hundreds of thousands of SEIU members across California. According to UHW, the election gives UHW members the option of forcing 65,000 homecare and nursing home workers out of UHW and into a statewide long-term care union, or of voting to authorize SEIU to eliminate UHW entirely by creating a “new” statewide healthcare workers union. Understandably, this choice between losing nearly half its members or all of its members is not real popular with UHW. This explains why Andy Stern’s name brought down a cascade of boos each and every time it was mentioned last night, and why there was an overwhelming mood of defiance in the face of this new election challenge. According to Roselli, Plan C involves the international filing charges against 24 elected UHW leaders. This would potentially disqualify them from serving in leadership, paving the way for a takeover of UFW by those loyal to the International. Having known Lewis since 1981, and her husband, Gary Guthman, since his UFW days in the 1970’s, I know they would not say their members are happy if they did not believe it. There are UFW alums and people of tremendous integrity on both sides of this struggle, which is why a unified SEIU is so powerful. It is also why having these activists at war with each other is so destructive. Andy Stern has an ambitious and pro-active organizing agenda for Obama’s first One Hundred Days. SEIU’s entire organizing team will be in the field building support for universal health care, the Employee Free Choice Act, and other union priorities. But it will not be easy for Stern to accomplish this agenda while also battling Sal Roselli and UHW. And this is not a fight that will be confined to California. No way. UHW is already taking this fight to progressive groups across the nation, and academics, politicians and labor officials are already choosing sides. Can anyone stop this internal war from escalating? Well, incoming President Obama needs SEIU and UHW on the same team. Obama (or his Secretary of Labor) may be the only figures that can broker a peace that keeps SEIU and UHW working together for change. As Obama repeatedly said on the campaign trail: the stakes are too high, and we have come too far, not to finish what we have started. The progressive movement needs a strong and unified SEIU, and this worsening civil war must end.